Antarctica is important to the climate of the whole planet, it acts as a barometer of change. Antarctic weather and climate systems once thought to be largely isolated are now known to feed into the systems of the rest of the world and can act as a buffer to changes or continue climate changes long after the triggers have been stabilized. Ice flow rate map of Antarctica showing how ice from the great sheet covering the continent reaches the sea at relatively few points around the coast via very active glaciers and ice shelves. The map is the result of twenty years of data from satellites. Antarctic ice cover is a regulator of energy absorbed from the sun, ice reflects back the sun's energy causing less warming, changes may have far reaching effects. 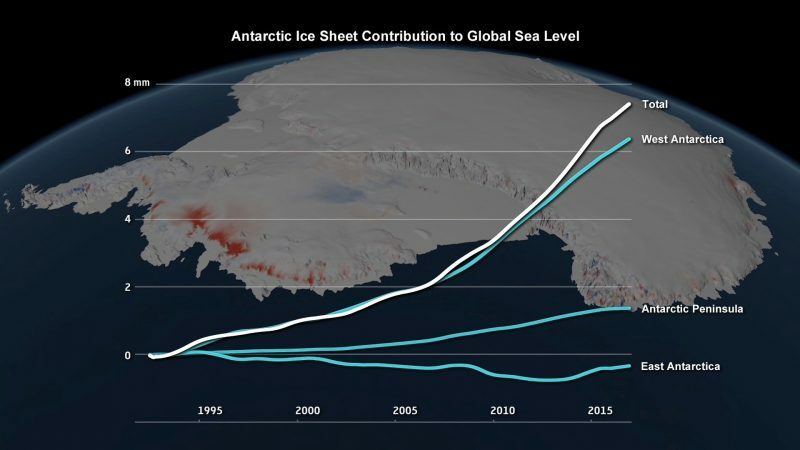 Antarctic glaciers and ice shelves contain huge amounts of water that could potentially raise sea levels around the world if they collapse or melt. The size and rate of ice berg formation and position of the edge of ice shelves are monitored to understand the bigger picture. Each winter sea ice forms around Antarctica approximately doubling the area of the continent, the extent and thickness of this ice gives an indication of short and long-term temperature and climate changes of the sea and atmosphere. Antarctic ice contains a climate record going back a million years. 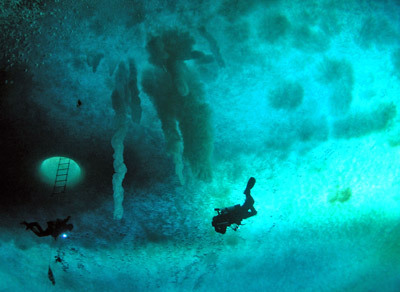 As it forms, ice contains trapped bubbles of air from that time allowing us to sample the atmosphere at known times in the past so allowing us to learn about ancient climates in detail. The ozone hole over Antarctica is now known to have climate effects that extend into other regions. Ocean currents transport warm and cold water around the planet and Antarctica plays a crucial role in these circulations, understanding these circulations allow us to predict changes. Because Antarctica is so isolated and relatively unaffected by the immediate presence of people, it is an ideal place to carry out experiments and observations, it also reacts in ways that make it a good barometer of changes that are less easy to decipher elsewhere. Society and its leaders need the best evidence and understanding of the mechanisms and effects of climate change, both current and for future forecasts. We need to be able to separate changes that are naturally occurring from those that are the result of or exacerbated by human activities. In either case building a sophisticated predictive model is of the utmost importance and this requires reliable and accurate observation and measurement of Antarctic climate past and present. Here are some climate science research projects taking place now or recently in Antarctica. 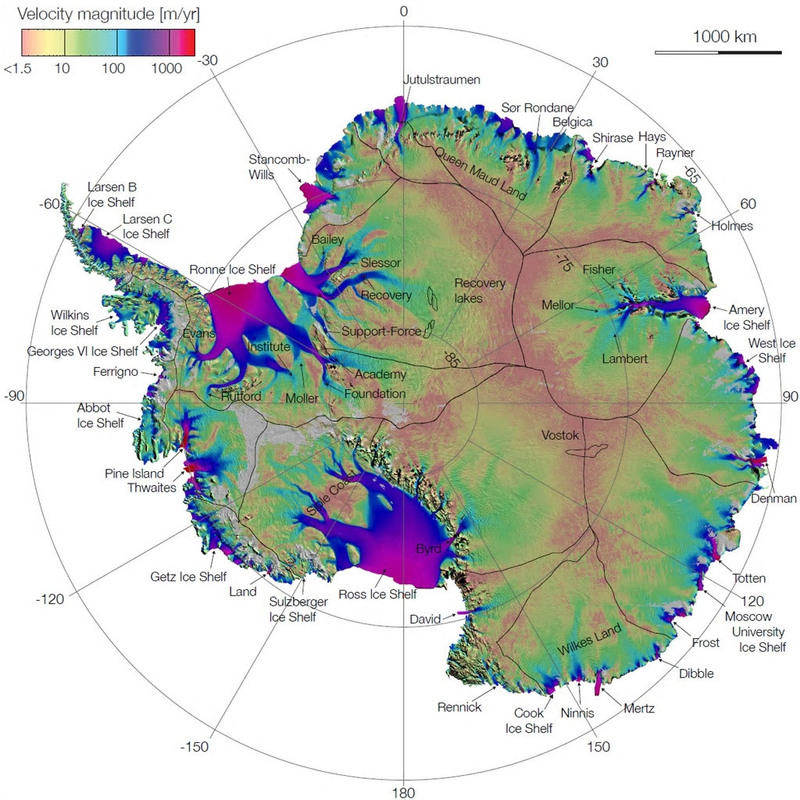 Observations and measurement of the ice covering Antarctica, the way that glaciers flow, the formation of ice shelves and ice bergs and the seasonal changes in sea-ice are of the utmost importance to climate scientists, in particular tracking the ways that these things change over time is vital to understanding climate changes. Antarctica is however a very big and distant place, covering 14 million square kilometers with another 18 million square kilometers of sea-ice that forms and mostly melts again every year. Combined with its remoteness, this presents significant practical difficulties in measuring and monitoring the ice. In recent years a combination of satellites and aircraft flying patterns across the whole of the continent have allowed observations, measurements and visualizations of the ice cover and how it changes to be determined in unprecedented detail. Instruments can continually measure parameters such as snow depth, ice elevation, ice thickness, surface temperature, bed rock topography and a range of other characteristics of sea ice, ice sheets and glaciers as the satellite or aircraft flies over. 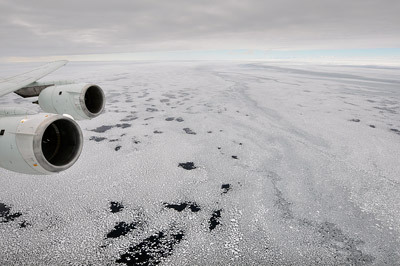 Sea ice seen out the window of a NASA DC-8 research aircraft at 2,000 feet above the Bellingshausen Sea, West Antarctica, 2009. Antarctica is amostly ice covered area that reflects the light and heat of the sun to play a large part in the regulation of climate in the region and globally. 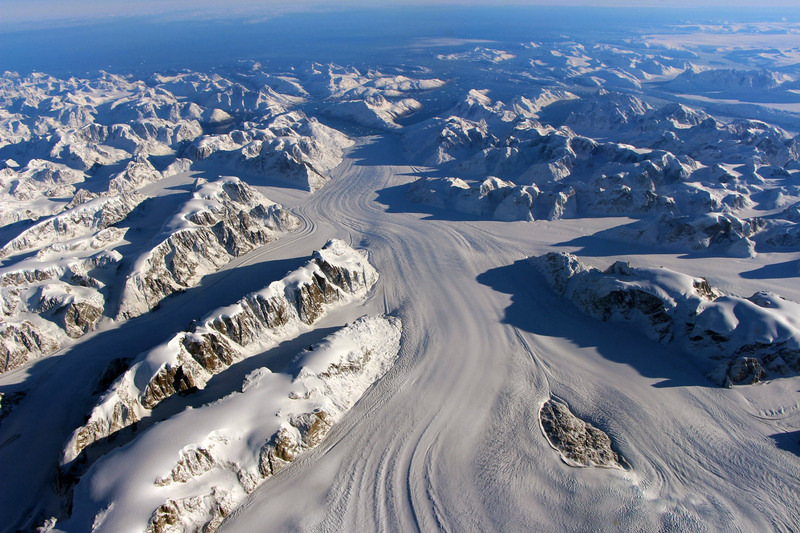 This ice cover has grown and shrunk repeatedly over geological time with eight cycles of an ice age followed by a warm period in the last 800,00 years, this growth and shrinkage of the ice cover has resulted in a rise and fall in global sea levels. Evidence from ice cores and marine sediments have allowed us to discover these changes in some detail along with other factors such as temperature and carbon dioxide levels in the atmosphere. This enables us to get a better picture of what stage in the cycle we are in currently and what may happen in the future. This ice is not however a simple layer over the land that is uniformly slipping sea-wards. 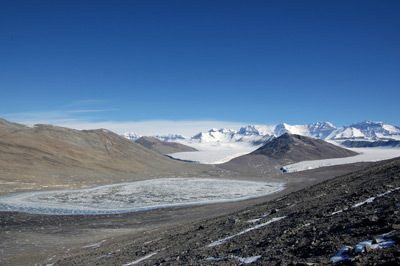 The presence of largely buried mountain ranges under the ice, a surface bed-rock layer that is far from smooth and may be as much as 2,555m (8,382 ft) below sea-level at the Bentley sub-glacial trench make the situation much more complex. Mountains, floating ice shelves, ridges and bumps where glaciers can snag whether on land or once they are floating mean that the ice flowing to the coast gets channeled at certain points and some glaciers where they meet the sea act like a leaky cork in a tipped up bottle. The ice still flows though much more slowly than it would if the cork were removed. A current concern is whether or not one or more of these glacier "corks" may slip out so releasing the ice behind them at a much faster rate. Sea ice in Antarctica forms each year as the autumn arrives in March and April and starts to break up and melt during October and November, about 18 million square kilometers of ice form during this time which more than doubles the continental area, this is the biggest seasonal change on earth. Most of the ice is one-year ice which forms and melts again as the edge of the Antarctic Ocean is unconstrained by land unlike in the Arctic where multi year ice is more common. Like the continental ice, sea ice reflects sunlight, it also forms a barrier between the sea and the air so affecting how heat and gases (principally carbon dioxide) are exchanged. Sea ice formation and melting also affect the saltiness of the surface waters affecting density and melting point which in turn affects the mixing of surface and deeper waters which can have effects on climate at a local and global level. Picture right - a Foehn wind causing a blanket of cloud known as a Foehn bank, the kind that caused melting that led to the collapse of the Larsen C ice shelf. 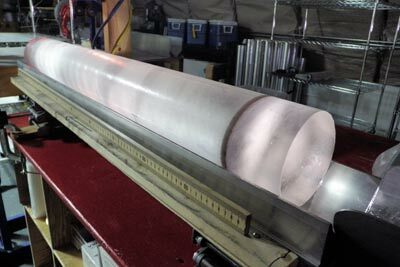 An ice core is a cylinder of ice that is drilled out of an ice cap using a tubular drill bit typically 10-20cm in diameter and from 1-6m long. The drill is lowered on a steel cable and is powered by an electric motor on top of the drill bit, fed by power from an electrical cable from the surface. 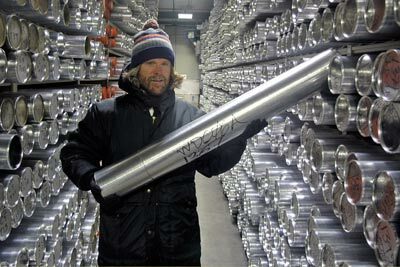 Once the bit is full of an ice core, it is brought back to the surface and the ice is carefully removed, labeled and stored. The drill is now lowered into the hole again to take the next ice core, going further back in time the deeper it gets. The cores of ice can be aged and chemically and isotopically sampled to determine the temperature at the time of formation and the atmospheric gas concentrations at known points in the past. By this means we can determine when past ice ages started and ended. Data for this has come from the Antarctic and Greenland ice sheets. Unequivocal evidence has shown that since the start of the Industrial Revolution when fossil fuels began to be burnt in great quantity, the amount of greenhouse gases entering the atmosphere has increased beyond that caused by natural events. The current amount of atmospheric carbon dioxide at over 400 parts per million and steadily rising (see here for daily figures) is greater than any value measured in ice cores covering the last 800,000 years. The figure of 800,000 is the longest we can currently go back and measure carbon dioxide levels with any degree of accuracy. See here for more detail on drilling ice cores. An ice core removed from the drill. Ice cores are transported very carefully from Antarctica and stored in giant freezers. The ozone "hole" over Antarctica is a thinning of the layer of naturally occurring ozone gas found at high altitudes that filter out some of the ultra violet radiation coming from the sun. This varies in size over the year growing during the winter months peaking in September and then recovering somewhat during the summer. In 1985 the size of the ozone hole was discovered to be far bigger and more severe than previously thought. Ozone depletion is caused by industrial chemicals called chlorofluorocarbons (CFC's), international agreement on their reduction was agreed in 1987, the so-called "Montreal Protocol". Aside from the problems of the ozone hole caused by extra ultra violet light getting through it is now known that the ozone hole has a profound effect on the climate of Antarctica. Ozone is found high up in the stratosphere, a thinning over Antarctica caused a fall in the temperature in this layer leading to an increased difference in temperature compared to the tropics leading to effects on the Southern Hemisphere weather patterns. Since 1980 the strength of winds in the Southern Ocean have increased by 15% as a result so acting against the warming effects of greenhouse gases to some extent bringing warmth inwards from more northern regions and allowing more heat to pass out t space. The surface ocean waters around Antarctica become very cold and salty as salt is expelled from sea ice as it forms and ages. This water becomes dense and sinks, it is known as Antarctic Bottom Water and is formed mainly in the Ross and Weddell Seas. It is the densest of of sea water masses in the world, sinking deep and flowing northwards becoming an important component of a planet-wide circulatory system called the "great ocean conveyor". This is very important in that it redistributes heat around the planet as cold and warm water masses are moved around. This dense mass of water also takes much of the extra carbon dioxide gas from the atmosphere with it that has been generated since the industrial revolution. Gases dissolve better in water that is cold and the waves and mixing in the Southern Ocean caused by strong circumpolar westerly winds mean that it is a particularly good "sink" for the extra greenhouse gas, though it is becoming more acidic in the process which poses problems for living things that make shells. The Southern Ocean currently absorbs over 40% of human produced carbon dioxide. Being so far removed from major population centres and difficult to get to, Antarctica is the largest place on earth that is not directly influenced by human activities. This makes it a good place to carry out studies and observations that elsewhere may be confused by other factors. The fact that it is largely frozen, though temperatures may sometimes rise above freezing temporarily also make it a good place to see the wider affects of relatively small increases in average temperatures. For instance if the average temperature of a place is below freezing and fluctuations still don't take the temperature above freezing, everything remains solid and icy. A small increase in average temperature may result in the average still being below freezing, but fluctuations above freezing, so that snow man you made ten years ago and is still there suddenly melts one afternoon, even though it gets cold again in the evening - for example. There is evidence from across the world that intense weather events are becoming more frequent and this extends to Antarctica as measured in the Dry Valleys. The temperature doesn't doesn't even need to get above freezing point for melting to occur on a particularly sunny day. Changes in the Dry Valleys involving more melting and thawing are starting to change the biological communities already from what was a steady state for as long as they have been measured until just after 2000. While changes to a very impoverished ecosystem in Antarctica may seem of little consequence, such studies show in isolation what kinds of changes can occur with what appear to be relatively small shifts in temperature and help to give insights into how other parts of the world may react. In other regions, the shifts in populations may affect pest species. Weather data from surface and upper air measurements for forecasting and showing climatic trends. Observations of annual changes in upper atmosphere ozone concentrations. Samples of air and snow to monitor changes in greenhouse gases in the atmosphere and in the ice. Monitoring of selected marine species various locations. 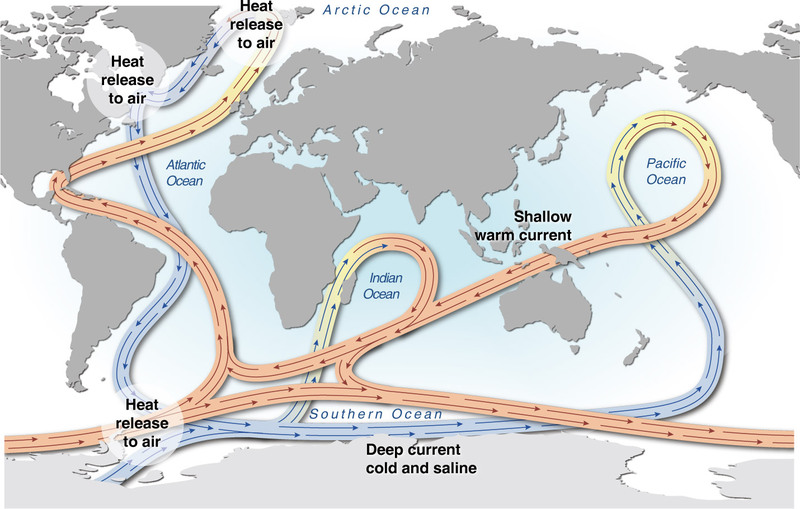 Measurements of changes in ocean currents, nutrients and temperature. Sea-ice observations to identify annual and ten-year trends. Surveying the diversity of groups of organisms on land and at sea and how they change over time. Surveys of ice and surface features such as glaciers and ice streams. Aerial photography and ground-based topographic surveys.